In a second scenario (box table 4.2) the freezing up of credit is assumed to spread to two larger Euro Area economies (equal to around 30 percent of Euro Area GDP), generating similar declines in the GDP and imports of those economies. Repercussions to the Euro Area, global financial systems and precautionary savings are much larger because the shock is 6 times larger. Euro Area GDP falls by 6.0 percent relative to the baseline in 2013. 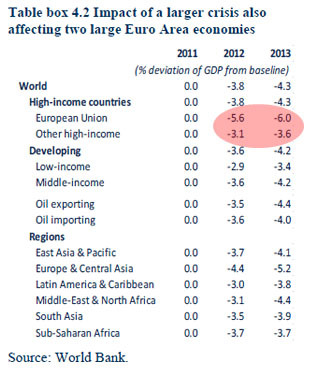 GDP impacts for other high-income countries (-3.6 percent of GDP) and developing countries (-4.2 percent ) are less severe but still enough to push them into a deep recession. Overall, global trade falls by 2.6 percent (7.5 percent relative to baseline) and oil prices by 24 percent (5 percent for food). So there you have it. If the eurozone crisis turns out to be worse than we think, growth in the EU will be nearly 6 points below their last forecast and growth in other rich countries — including us — would be more than 3 points below their last forecast. That’s enough to send us skittering back into a recession regardless of whether our economic fundamentals are in good shape or not. How likely is this? That’s more a political question than an economic one, which makes it more than usually difficult to forecast. Against all odds, I still think that European leaders understand the stakes and will avoid the worst once they run out of all other choices. But I’m not sure what odds I’d put on that.